2 How to apply Nepali passport? Passport is considered as one of the official document that is given by the government to identify their citizen which also help the people to travel from one place to another. A passport is considered as the citizenship and as well as the travel document. The MRP passport contains the personal detail of the owner like name, photo, date of birth father’s name, your address and so on. Well, a passport does not last for the lifetime once we get it. Passport has its validity period and it expires after a certain time. Usually one passport valid for 10 years. In the context of Nepal passport are optional as our government issue citizenship to us. We can only apply for the passport once we get the citizenship. Nepalese passport also contains the photo of the owner, name, address, father’s name, citizenship number date of issue and date of expiry. In earlier days Nepal government used to issue the handwritten passport to their citizen. In Nepal, there are four different type of passport available with the different cover page color. Ordinary passport contains green color front cover. 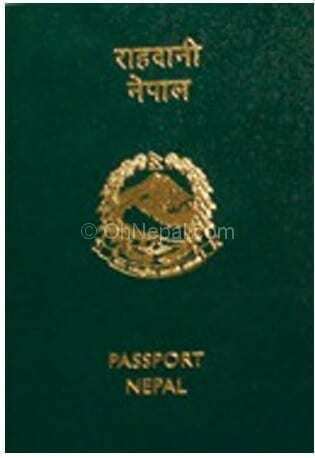 This passport is given to anyone who is Nepali citizen wish to get it in order to apply for the abroad and go there. Official passport which contains blue color which is given to the government officer in order to travel from one place to another due to the official work. Let us take an example like government officer need to attain the seminar or other programs in other countries than this type of passport are issued. This type of passport is only provided to the government officer. Diplomatic passport with red color front cover. Travel document with black color. A Machine-Readable Passport is new in the context of Nepal. It was introduced in the year 2010, when Nepal become the member of ICAO, before that there is handwritten or manual passport available in Nepal. Passports are one of our identity which indicates which country you belong to when you are in abroad. Those passports which have the machine-readable zone which is usually at the bottom of the identity page which scans the data and identifies your detail so are said MRP passport. How to apply Nepali passport? 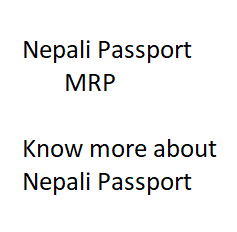 We have already provided the Nepali Passport Form Fill up Online Tutorial. This will guide you on how to fill up online form for MRP. To get a passport these days we need to Nepali citizen. Once you become the Nepali citizen you can apply for the passport from your district headquarters or from Kathmandu Pararastara Mantralaya. At the time of applying for the passport, you need to have the document like citizenship and MRP size recent photos. Once you have the required documentation, you need to fill up the form online and submit it to the CDO office with the charge of the passport which may differ according to you are applying. One that is ordinary passport which you get after 30 and above working days cost Rs. 5000/ whereas if want to apply for the fast track passport than it cost Rs. 10000/-. You need a passport to travel different countries. You don’t need a passport to travel inside your own country but if you want to go abroad like Canada USA Australia and so on then we definitely need a passport where we need to stamp visa for which purpose you are traveling to those countries. There are different types of visa available like study visa, working visa, visit visa, business visa and other different kinds. You need to get the visa according to your need and then only can travel to those countries by taking the passport. Nepalese people do not need visa or passport to travel to its neighboring country India. Except for India, you need a passport to travel all other countries from Nepal. Even though we need passport some countries provide visa on the immigration at the airport whereas for some countries we need to get the visa beforehand. Nepali passport is treated as a weakest passport in the world having on arrival visa for only 37 countries. Nepal is ranked as a sixth weakest passport of the world after five countries namely Afghanistan, Somalia, Iraq, Pakistan and Eritrea. Nepalese need visa for all countries except 37 countries listed over here. Nepalese can travel to these countries listed above easily just by issuing a plane ticket and having sufficient fund on their pocket for the stay. Different countries listed above have different rules and regulations for the time duration of stay over their countries. Bolivia, Gambia, Haiti, Guinea-Bissau, Kenya, Malawi, Madagascar and Mauritius allows 90 days stay over their country with on arrival visa for Nepalese. Cambodia, Laos, Singapore, Maldives, Micronesia, Mozambique, Myanmar, Palau, Pakistan, Philippines, Saint Vincent and the Grenadines, Seychelles allows for 30 days stay over their country with on arrival visa for Nepalese. If you are Nepali resident and if wish to visit a good place with on arrival visa, you can have a trip to Singapore which has a cheap airfare from Nepal (around 43,000). You can have a hotel booking from Agoda which has various price range of hotels. Remember: You must have two way plane ticket for going these countries, must have sufficient cash on your pocket for your stay and a hotel/motel/guesthouse booking slip, otherwise, immigration department of the country do not allow you to enter their country. It will be plus point if you have identity card with you. Nepalese immigration encourage individuals to carry at least $1000 while traveling abroad.